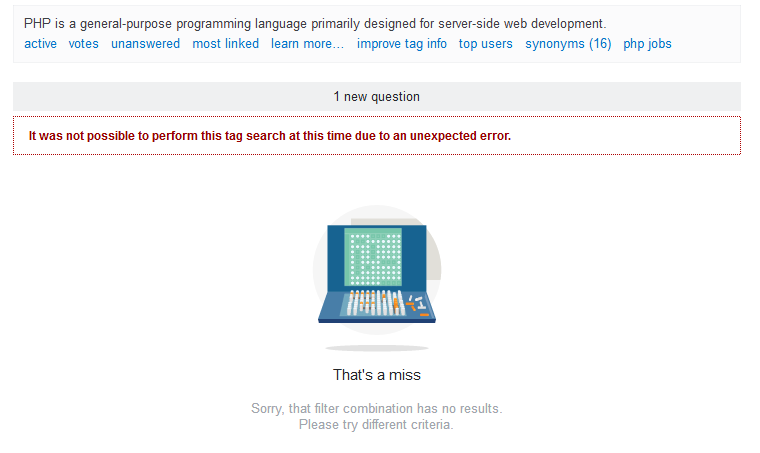 I have been seeing this a few times while on StackOverflow.com. The first time, was on April 29th and again just a few minutes ago. 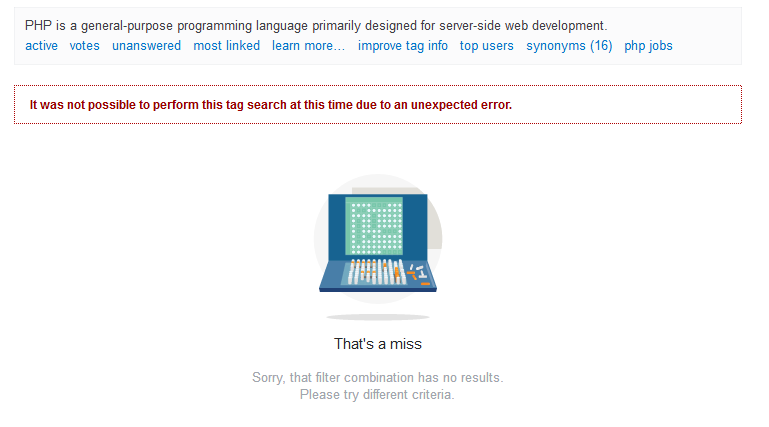 I thought it was only for the "php" tag, but did browse other tags and it was showing the same error. It came back to normal a minute or two later; this for both times I encountered this. I did not post a question about it the first time I saw this, and decided to post one since this happened to me again and there are others who experienced the same thing. I have never seen this type of error message before. Is this a new bug or is the network undergoing pre-tests from a post I saw recently that is planned for May 3rd? The first was taken on April 29th. It just happened again now, at approximately 9:54 am, EST. This happened again at approximately 10:33 am EST and its frequency seems to be augmenting. The short summary of this one is "because internet"; it turns out some annoying folks were doing annoying things specifically to be annoying, and a side-effect was disproportionate performance impact to a particular sub-system (the "tag engine"). I sincerely doubt that it was accidental or simply "oops my innocent crawler had an impact on your site? I simply didn't know...", based on the pattern of behaviour and the particular hoops they jumped through to hide their tracks. Anyway, as far as annoying bots go: that's what we call "a day with a 'y' in"; it was low-key enough not to set off any too urgent alarm bells, but it made it onto our radar, as has now been squished. No console or network errors are reported back to the browser - it presumably therefore an internally-generated error. Clearing cache doesn't resolve the issue (expected due to #1). Disabling any browser extensions and reloading the page doesn't resolve the issue (again, expected due to #1). Leaving the page open results in new questions coming through (with the usual "n new questions" message) as seen in the second image in the original post. What did seem to resolve the issue was simply clicking on the logo to return to the main page and then clicking back on the tag I was trying to search for - although whether this was just coincidence I do not know. 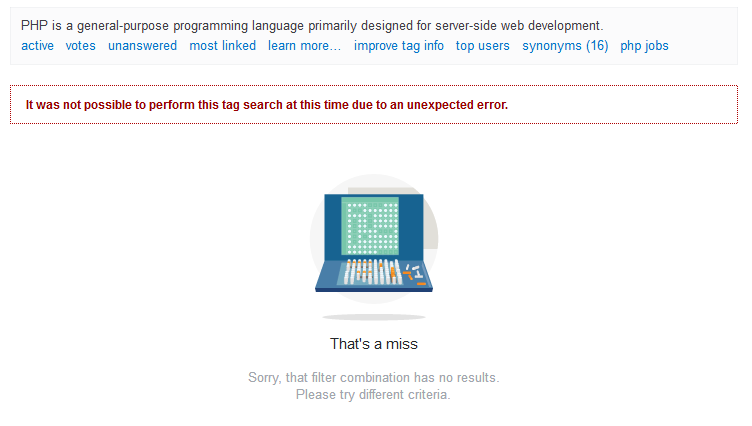 This doesn't seem to be affecting a specific tag, either. Earlier it was occurring for me on regex and reactjs and just now it was affecting css-selectors. Not the answer you're looking for? Browse other questions tagged bug error-message .